Singapore will once again be blessed with the Ceremonial visit by the Divine Utsavar Deity of Sree Bhagavathy Amman from the famous Chakkulathukavu Temple in Kerala which is believed to be 3000 years old. This temple is well known around the world because of many miraculous happenings here and the temple is a popular pilgrim centre in India today. Chakkulathukavu Sree Bhagavathy Amman, fondly referred as Chakkulathamma is famously known as the Mother who answers the call of HER devotees. Countless pilgrims visit this temple every year. 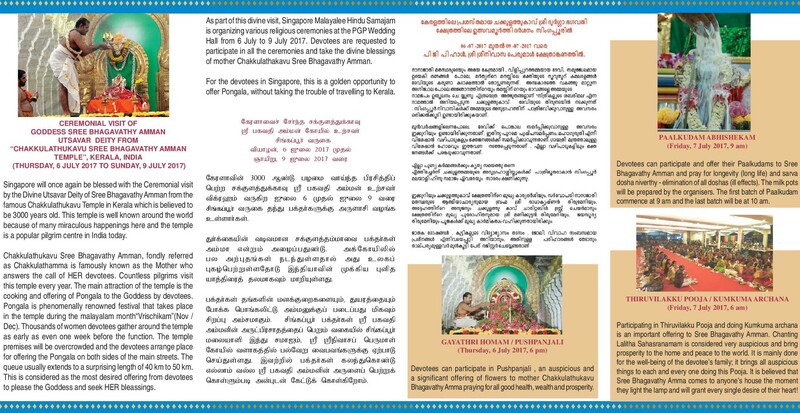 The main attraction of the temple is the cooking and offering of Pongala to the Goddess by devotees. Pongala is phenomenally renowned festival that takes place in the temple during the malayalam month“Vrischikam”(Nov / Dec). Thousands of women devotees gather around the temple as early as even one week before the function. 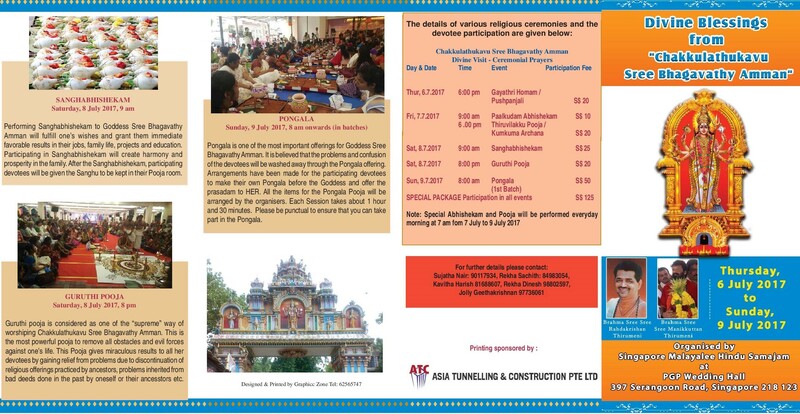 The temple premises will be overcrowded and the devotees arrange place for offering the Pongala on both sides of the main streets. The queue usually extends to a surprising length of 40 km to 50 km. This is considered as the most desired offering from devotees to please the Goddess and seek HER bleassings.